stock is now into its third airline promotional livery. First it was Continental Airlines, then Delta Airlines, but now in a move away from North America to the Far East units are now beginning to display Emirates vinyls. As observed on 22nd October - 002 Australia with surfboarders , 003 China with Dragon and 006 Africa with Ostriches. 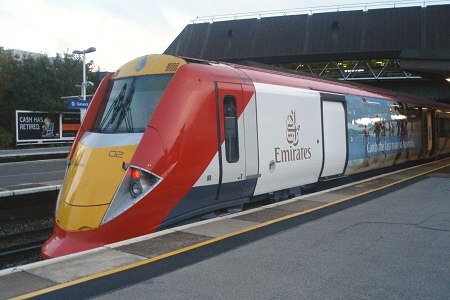 Subsequently 004 has appeared in Emirates branding without a specific country. 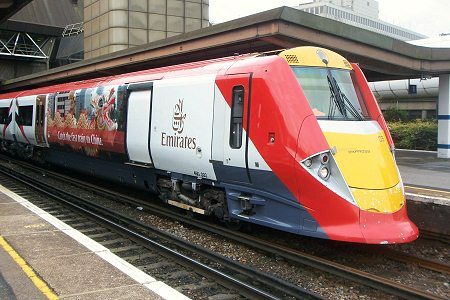 The other six units are still in base livery. 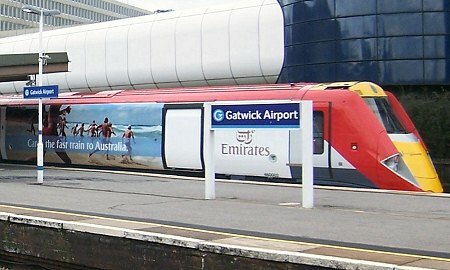 (left) The other side of 002, showing the beach scene slightly clearer, at Gatwick Airport on 25th October. 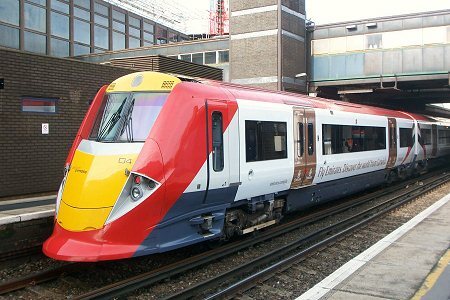 (left) On the adjacent platform face at the same time was 003, displaying its Chinese Dragon graphics. (left) Also seen at Gatwick on 25th October was 004. Here we view the driving motor open standard which shows the brandings and decoration carried on vehicles other than the driving motor luggage first open. Note the gold doors.